I originally wrote the following missive for “GetGlue”. However, since the website there is in a state of change and “Redefinition”, when you view it there you only get half of the total text. So, I am posting it here, and maybe some people who are not familiar with the majesty of the world of anime will see it, and give it a try. 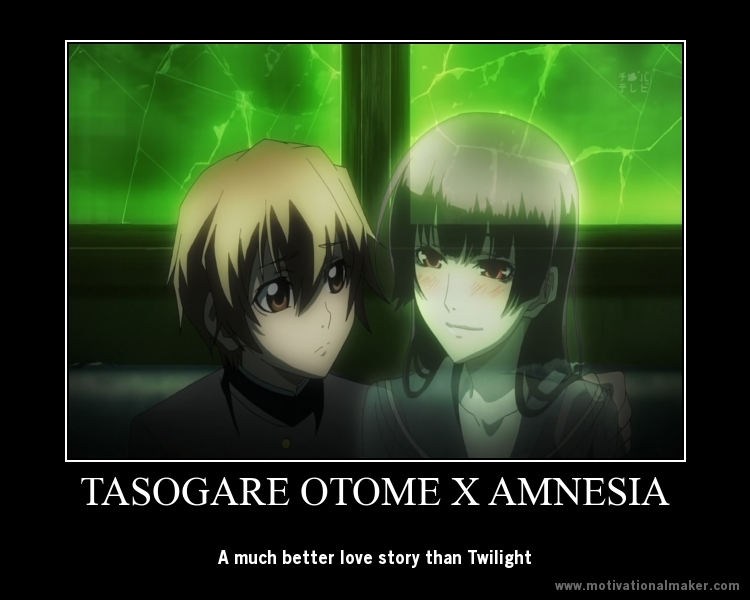 The series reviewed, “Ghost Maiden of Amnesia” is a good anime to try if you’ve never watched it. It isn’t rated, and it isn’t bad, but some of the themes may be a bit mature for the really younger demographic. It is probably a “Teen +” show. That being said, here is my review of “Ghost Maiden of Amnesia” as it should have appeared on the GetGlue site, were it not truncated. Invigoratingly fresh anime. This story starts with two opening sequences-in the first, the viewer can only see the living. In the second, the viewer sees that a ghost is, in fact, in residence and is trying to get the school’s “Paranormal Society Club” to investigate her *condition* since she has no memory before dying. Very well crafted first episode that can literally take the story down any road the writer chooses. This is a 5 thumbs up story! **Addendum – as the episodes progress the viewer is taken back in time to where the central male character, Teiichi, first sees the central female character, the “Ghost Maiden” , Yuko Kanoe. The viewer meets Kiire Kanoe, who happens to be the granddaughter of the sister of the Ghost Maiden Yuko, Who died at the school (Seikyou Academy) 50 years ago. Because the school was built over an old shrine, a ghost story has always existed about the Maiden that will play “Hide & Seek” with a student, and steal their soul. Teiichi encounters Yuko as a normal looking high school girl, but Kiire sees her as a dripping black mass with red eyes. Upon her description, Teiichi also sees Yuko as the black mass, but denying that she could ever have that form she reverts to her schoolgirl self once again, and it is decided that whomever can see Yuko will perceive her to be as they believe, individually, she will look. Next the viewer encounters Omoe, an enthusiastic paranormal researcher who cannot perceive Yuko at all. However, indescribable coincidences lead to the fact that whenever Kiire or Teiichi speak to Yuko, what they say is an almost exact answer to what Omoe is thinking, leading her to believe they can read her mind. By the third episode the viewer learns that the school is, in fact, built over an abandoned shrine; more, darker, spirits than Yuko possibly inhabit it. There seem to be 7 cursed objects or locations that the Ghost Maiden is supposed to haunt, and the trio of ghost hunters and one ghost begin to explore them one by one. As they seek out each object, Teiichi and Yuko grow closer together, for Teiichi is the only living human who has touched Yuko in 50 years. This anime is excessively interesting because the viewer is left thinking at each of the 7 plot points, that the Evil Spirit could actually be Yuko. Having only seen the first four (available) episodes, one anxiously awaits the discovery of what will happen next.